Christmas is approaching rapidly and again everybody is struggling to find the perfect Christmas gift. Don’t worry though, here’s our pick of this year’s best gifts aimed at those who love languages, exploring different cultures and travelling. There are thousands of languages around the world; however, there is just one universal language that brings people together: food. Everyone loves good food, good food reminds us of home, good food is an integral part of being human. So, why don’t we take a round-the-world journey and try to get to know recipes from every continent? The United World Cuisine makes it possible. This cookbook, which contains 50 great recipes, was written by United World College staff, students and alumni. It was published to celebrate UWC’s 50th anniversary. Their aim target was to bring a great variety of smells and mouth-watering tastes from all around the world into our kitchen by collecting recipes that are simple and delicious, so you don’t have to be a master chef to prepare them! Your sister, your grandma or your friend love crossword puzzles? The NY Times Touch-Screen Crossword Puzzle is the perfect gift! This little machine is not only fun it also strengthens your vocabulary immensely – this is useful especially for non-native English speakers. In this simple way, you can improve your brain performance by exercising your memory and attention. Why don’t you surprise your family and friends with this gift? The most common gifts for Christmas are probably books. There is a wide range of genres like thriller, novels, children’s books, etc., but why don’t you get the most hilarious collection of quotations and give it as a present to someone, who loves a good laugh? The Funniest Thing You Never Said is a brilliant collection of classic and contemporary quotes from Oscar Wilde, Winston Churchill, Jonathan Ross and many more – “’Fragile’ is usually interpreted by postal workers as ‘please throw underarm’” or “A synonym is a word you use when you can’t spell the word you first thought of”. You can sit together in front of the Christmas tree and read out loud some of those witty quotations and have a good laugh with your entire family! You are tired of buying books as gifts? Why don’t you get a funny bag, mug or button with linguistic-related prints like “I’m silently correcting your grammar”, or “You had me at the proper use of ‘You’re’”. Your linguist friends would be definitely delighted! At Zazzle, which offers a wide range of different products, they even have the possibility to customize their favourite product. In this funny way, they can subtly reveal their (linguistic) thoughts. Do you have a friend or family member who loves museums and its historical and cultural atmosphere and exciting exhibitions as well as historical artefacts? How about a membership in The British Museum? The British Museum which is located in London is dedicated to human history and culture; therefore, a membership would enable you to enjoy exclusive benefits including special events and unlimited free entry to exhibitions. You have the choice; you can either get an Individual or even a Joint Gift Membership, so that the presentee can share his passion with another person! If you are looking for a unique gift for someone who loves travelling or even thinks about doing a journey across the world, the best gift would be an open ticket to travel across the world, but if your budget is slightly lower, the most suitable gift is a scratch off personalised world map! Scratch Map is a wonderful adornment to any bedroom or kitchen wall is not a common map but your personal map as it shows all the places you have visited! The Chicago Manual of Style also called the editors’ bible is a must have for every self-respecting linguist, as it is considered as “one of the most widely used and respected style guides in the United States”. It covers a huge range of topics from manuscript preparations and publications to grammar, usage and documentation. For these reasons it is not only an important guide for writers but also for translators, publishers and editors. This movie is the perfect gift for those who love languages, particularly the less common ones. The linguists Davis Harrison and Gregory Anderson travel around the world penetrating the heart of cultures in order to analyse everything about language extinction and language documentation. This documentary shows recordings of some of the last speakers of several dying languages such as Chulym in Siberia, Chemehuevi in Arizona, Sora in Orissa, India and e Kallawaya in Bolivia. There are no doubts about how much linguistics and people in general love books and if you are struggling to find a Christmas gift because you don’t want to buy a book again an Amazon gift voucher could solve all your problems and turn itself into a very useful and appreciated gift. This is a travel companion which can help you from getting on the right train platform when you are in a hurry to find out what is the curious ingredient in the mail you ordered! 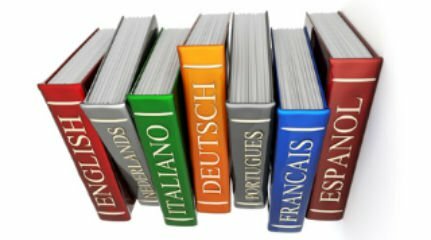 It is always helpful to have at hand a collection of useful phrases suitable for every different situation and in many different languages. They can be used by travellers, linguistics, foreign culture lovers or simply by everyone! So there you have it! Our top ten present ideas for 2013. Merry Christmas! Festively researched and written for the Culture Vulture by Laura Febo and Paula Grzesniak.